We're always thrilled to be able to lend a hand when we can to help out worthy charitable causes, so we're delighted to announce a new addition to our charity. We've teamed up with Guide Dogs UK Charity for the Blind and Partially Sighted, and will donate 10% of the profit from this great new bouquet straight to this extremely noble cause. 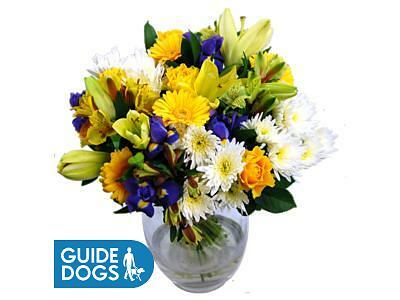 The Guide Dogs UK Bouquet is a busy, happy arrangement. If it was a dog it would be panting and wagging its tail! It contains a selection of gerbera, chrysanthemums, beautiful irises, serene lilies and regal roses. The effect is an absolute deluge of scents, sights and colours. It's like a magical garden, all for you. Guide Dogs UK are of course an extremely important charity. They were founded in 1931 by two women in Merseyside, and have since risen to become the world's largest breeder and trainer of working dogs, helping over 29,000 people to live more comfortable lives. They aim to deliver a world class guide dog service as part of a range of mobility services, stating that "We will not rest until blind and partially sighted people can enjoy the same freedom of movement as everyone else." Our charity bouquet come with all of the same great options as the rest of our products. This means that you can add great extras like Lily O'Brien's chocolates, cute teddy bears or handwritten cards to your order. And of course the whole bouquet will come expertly arranged by our professional florists, and delivered next-day for FREE, to any address in the UK! The Guide Dogs UK Bouquet forms part of our exclusive Charity Bouquets Collection, a wonderful range of beautiful bouquets designed specifically to help charitable causes.